put together the company Canopy Management. All their wine names are fun: Middle Sister, Promisquous [sic], Monogamy. You'd expect that from a pair whose previous collaboration was a Chilean wine called Oops. What's new for them is their level of involvement in creating the wine, which is made at the custom crush facility at Adler Fels in Sonoma County. McDonald -- who says one of his first albums was a Deep Purple album he bought in 1968 -- plays a large role in sourcing the grapes. Most novice wine producers start by making wine they love, or wine they believe they can sell, and then find a market for it. Wheatley and McDonald were too smart for that. They had Target lined up as a client before the wine was ever made. And they made 8000 cases of Zin because that's how much they had orders for. In fact, the Zin is only a small part of the company's portfolio, which has reached 100,000 cases in less than two years. So you'll be seeing a lot more Promisquouty, or however you misspell it, at a grocery store near you soon. The Deep Purple wine is Zinfandel from Lodi from grapes purchased on the bulk market. It's easy to make a pretty good wine this way these days because the market for grapes is so weak. Moreover, McDonald has a special, unusual emphasis. "These days everybody is looking for super-ripe, ultra-ripe Zinfandel. Fruit bombs," he said. "I like my wine more balanced than that. So I can pick up wine that people are having a hard time selling at a good price, and it's just great. Some of this comes from great old-vine vineyards with low yields that just don't kick up the sugars (and alcohol) to what the current trend is. I'm perfectly happy with these. The alcohol is 13.6. You just don't see that anymore." For $12, Deep Purple is a pretty good buy. I'm tired of reading wine writers (Eric Asimov) complaining that there aren't any good American wines under $20. You just have to look harder. 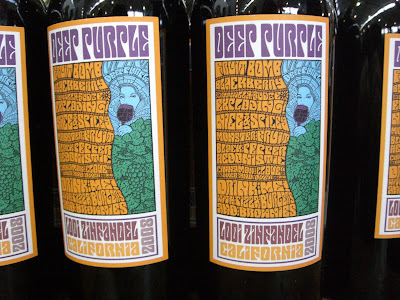 Deep Purple is the way Zinfandel used to be back when Deep Purple had its pick of underripe groupies -- spicy, medium-bodied and savory, with red fruit flavors and an earthy, tarry note. It ain't Ridge, but it ain't priced like Ridge. If it's successful, the quality might go down, because right now McDonald has his choice of bulk wines and doesn't have an onerous production quota. But the '07 and '08 are space truckin' in the cutout bin. My first question for Tim wasn't how do you make the wine -- I could have guessed that without asking -- or how did you get Target to carry it. Instead, I wanted to know, "How come the band hasn't sued you?" 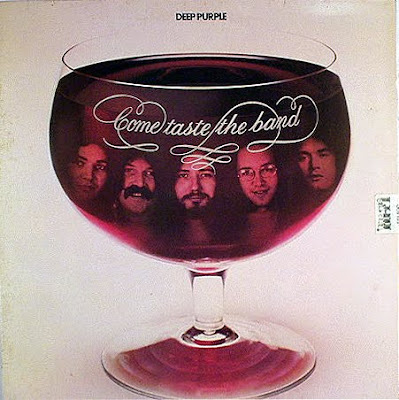 Turns out McDonald has trademarked Deep Purple as a wine, and that under US law, there's no possible confusion between products. Despite the recent album cover, one is an aging rock band, and the other is a fresh young wine. McDonald shipped a band member a bottle of wine, though he hasn't yet heard whether or not it inspired the group to burn down a recording studio. So we might yet see "This Deep Purple concert sponsored by Deep Purple!" Now if McDonald can just use his smooth PR skills to tell them there have to better ways to announce your availability to groupies than that album cover. Thanks for the morning laugh and I'll try to go into a Target store soon. righteous dude...I'll have to give it a try. Come taste the band is from 1976! Will this be available in Europe? Karl: I doubt that the producers will find it economically viable to sell in Europe, because it's meant to be affordable but shipping costs will kick the price into a higher category. Time for a US vacation!